Taya’s Transplant Journey Ryker, kidney transplant recipient participating in the Canadian Transplant Games in 2018.
n August 24, 2007 Jennifer and Trieu welcomed their baby girl, Taya into the world. For the first few weeks everything was wonderful and Jennifer, Trieu and Taryn, Taya’s older sister, were all excited to have Taya at home. The family noticed that Taya had lingering jaundice, but when they sought out medical advice a nurse told them that it was probably caused by the breastmilk. After ten weeks the jaundice had not improved. 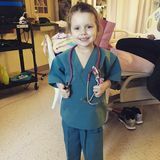 The family reached out to one of their friends who was a nurse and asked her opinion. Their friend, who was familiar with the signs of liver failure, worried that was the cause of the jaundice and suggested that the family take Taya to emergency right away. As soon as the family arrived at emergency, the medical team looking at Taya knew that something was very wrong. â&#x20AC;&#x153;Join our conversation at #DFFGives and tell us how you plan on giving back this holiday season.â&#x20AC;? The Foundation Board of Directors at the Annual General Meeting in Muskoka, ON this summer. David Foster and CEO Michael Ravenhill at the Boston Pizza Foundation fundraising event in Vancouver, B.C. hosted by CBC Dragon's Den entrepreneur and David Foster Foundation Board member, Jim Treliving. ach year during this time, I take the opportunity to ask our readers to consider making a donation to the David Foster Foundation. This year is no exception. John Danson working as the auctioneer during the Simply Spectacular Experience on Vancouver Island. Michael Ravenhill and Aleea Dahinden visit Cruz and his son Kayden, who is waiting for a heart transplant, at Toronto SickKids Hospital. Jennifer, mother, holds her daughter's hand one day after she was the living liver donor. Taya one month before her transplant. Taya with her sister Taryn at the hospital. 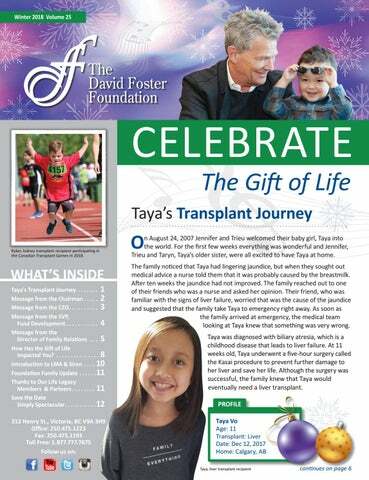 December 12, 2018 marks one year post transplant for Taya. Despite some minor bumps along the way within the first few months, Taya is doing very well. Taya will be on anti-rejection medication for the rest of her life, and she has gone down from taking twelve medications a day to four. Annually, she will have routine blood work and hospital appointments so her medical team can monitor her enzyme levels and the success of the transplant. Jennifer and Trieu are grateful that they get to watch their daughters grow up together and enjoy being kids once again. The David Foster Foundation meets with Siren Communications and LMA Communications in Toronto, ON. perspective. However, according to Siren Communications CEO Ann Layton, this campaign is personal. “I spent two years on the list for a liver transplant in the 1990’s. I am one of the very lucky people who has made a full recovery, but it means I have a very strong commitment to this cause.” The campaign plans for 2019 include fundraising events, a national media awareness campaign, social campaigns around Organ and Tissue Donor Awareness Month in April, outdoor advertising, and online organ donor registration drives. here is nothing greater than the gift of life through organ donation. Over the giving season, we are encouraging an online conversation about the importance of organ donation and asking people how they plan to give back. Join the conversation by using the hashtag #DFFGives and share how you give or why you think it's important to register to be an organ donor. Ryker, kidney transplant recipient participating in the Canadian Transplant Games in 2018. S AV E T H E DAT E! The David Foster Foundation is excited to once again offer a 4-day luxury experience with 16-time Grammy Award winner, David Foster. VILLA EYRIE RESORT | VANCOUVER ISLAND MOTORSPORT CIRCUIT | CULINARY CLASSES GOLFING | FISHING | SHOPPING | SPA | CELEBRITY ENTERTAINMENT For more information and to book your spot, please go to davidfosterfoundation.com. Be one of only 40 couples for this once-in-a-lifetime exclusive and intimate experience!